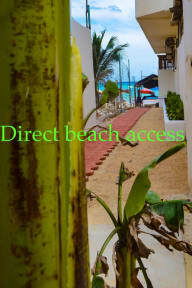 Our location is unbeatable, a few steps from the beach (literally) with our own private access to it, and a half block from the 5th avenue which is the main tourist corridor. The kitchen is fully equipped so you can prepare your own food in case you want to save some money. Also, if you are in a mood to make a bbq there is a grill on the courtyard for your delight. Everything is near from here, the main bus station, the ferry if you want to visit Cozumel for a day, the “colectivos” that take you to Tulum or the cenotes along the corridor “Playa-Tulum”. After a “rough” day at the beach, relax yourself in the hammocks. We do our best to keep this place as quiet as possible and this is why Popol Vuh isn’t a party hostel, although you can meet people around the world, drink some beers at the courtyard before heading to the night club for a wild night. Latest time to check in: 11:00 pm. Victor was so kind. Kept place very clean. Great location. Very quiet. Chill. affordable. Would recommend. Would recommend hostel to have more hooks or shelves for your belongings. But other than that perfect. Such a perfect location close to everything yet so quiet! Perfect for my partner and I as a base and also the option to cook if we want to safe money. A great kitchen with everything you need, hot showers, fans in the room and lovely staff. So close to the beach! A very basic single room right next to the beach. As someone who doesn’t host massive parties or like to brag about my travels on social media (@parttimeinteresting for proof), this is everything I could ask for. Right next to the beach, so perfect for running our into the rain to watch storms during hurricane season, and equally close to Fifth Avenue and the ADO tourist station. What more could you ask for at such a low price? Oh, the WiFi works, if that’s your bag. And plus too, great staff. A hotel sold as a hostel. Room was good given the location - spot on next to the beach. Although no views for us. Security was super tight. All the gates were locked at night. We almost missed the bus early next morning. We weren't told that one of the keys we got would open it. Very clean given the proximity to the beach. Good location - right next to the main road. Though a bit costly. No breakfast. Friendly staff. Wifi was fast. Great location in the center of town and next to the beach. Desk was supposed to reopen at 7:30-8:00 in the morning but we couldn’t wait past 8:30 to see how late the staff would be. No air conditioning just FYI. We were fine with 2 electric fans. I doesn't exist! Can I have my money back? ?